Inside a grave in Mount Auburn Cemetery in Cambridge, Massachusetts, is DNA that could finally put to rest debate about whether Abraham Lincoln's killer escaped capture and lived for years before committing suicide. What's that you say? Wasn't this all solved 145 years ago? That depends on who you ask. 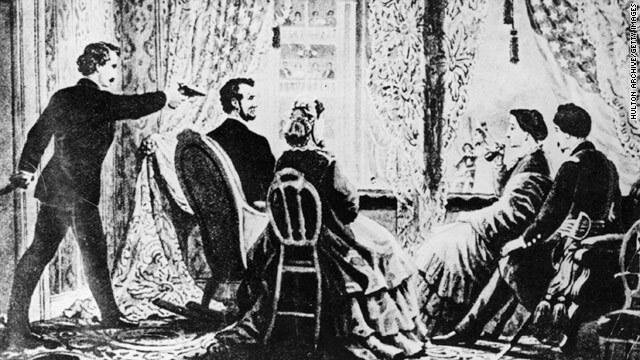 The way it's written in history books, John Wilkes Booth was cornered 12 days after shooting President Lincoln at Ford's Theatre and killed in a tobacco barn before being laid to rest in a family plot. But there have been several historians over the years not entirely satisfied with this version. "If the man who killed our greatest president got away and a giant hoax was perpetrated on the American people, then we should know about it," historian Nate Orlowek told The Philadelphia Inquirer. Descendants of Booth's have heard various stories about whether he was actually able to live another 38 years, traveling around the country and changing his name several times before killing himself, according to The Inquirer. The theory has been debated before in published books, documentaries, TV shows and even Thursday night on the History Channel on Brad Meltzer’s "Decoded," which is examining compelling mysteries from the past. Which brings us back to the present - and that grave in Cambridge. It contains the body of John Wilkes Booth's brother, Edwin Booth, who was a Shakespearean actor buried in 1893. Descendants of the men have now agreed to exhume the body of Edwin Booth in an effort to put the family drama to rest. “I just feel we have a right to know who’s buried there,’’ said Lois Trebisacci, 60, who told The Boston Globe she is Edwin Booth's great-great-great granddaughter. In 1995, the family tried to exhume the body inside the family plot that contains the man shot in the barn, but a judge denied the request. “The family was as much interested in disproving [the escape] theory as they were in proving it,’’ Mark Zaid, an attorney for Trebisacci, told the Globe. So now, the family is going to try the route with Edwin Booth's body, family members told the media. Though an exhumation request has not been made yet, if and when it is, DNA from Edwin Booth's body could be tested against vertebrae of the man shot in the barn, which is currently in the National Museum of Health and Medicine in Washington, D.C., and the Mutter Museum in Philadelphia. But not everyone is keen on doing that. A spokesman told The Inquirer that the National Museum of Health and Medicine was concerned about damage to the precious piece of history, just for the sake of trying to debunk a myth. But Jan Herman, chief historian for the Navy Medical Department and special assistant to the Navy surgeon general in Washington, said since only a small drill would be used, the sample wouldn't be damaged. It's very much a case of weighing what's worth it. "If it compares favorably, that's the end of the controversy," Herman told the Inquirer. "That was Booth in the barn, end of case. "If it doesn't match, you change American history." There is another option and that is that Lincoln would have survived the ball fired by Booth. What killed Lincoln was the bacteria laden fingers of Surgeon General Dr. Joseph K. Barnes who tried unsuccessfully to retrieve the ball from Lincolns open wound. So now "Who Killed Lincoln?" and Booth is a moot point. Interesting point you raise about the survivability of Lincoln's head wound. Under today's technology he would likely been back in action, witness the Congresswoman from Arizona who had a terrible wound compared to Lincoln's. There what-ifs from history are what makes the stories so interesting in my opinion. Re. Vonnie. Lincoln's goal was preservation of the union. He said if he could set all the slaves free and preserve the union, that would be his preference, but if he needed to maintain the status quo, he would do that to preserve the union. I believe he also said that he would go along with expanding slavery into new states if it preserve the union. He was somewhat indifferent toward the slavery issue. The Proclamation of Emancipation was criticized as "freeing no one." I think you have produced some rather interesting points. Not as well many others would really think about this the direction you just did. I am really impressed that there is so much about this subject that has been unveiled and you made it so nicely, with so considerably class. Brilliant one, man! Genuinely special things right here.